The much anticipated first look of Mahesh Babu’s next is released by the filmmakers on twitter and other social media. The movie is titled as SPYder and the first look posters featuring Mahesh babu are trending on social media. The movie is being directed by A.R. Murugadoss. Earlier, The film’s first look was set to release on Ugadi, March 29 but due to some issues, they postponed it for 15 days and released it finally today on April 12. The film is being directed by A.R. Murugadoss and Rakul Preet Singh is sharing the screen space with Mahesh in this bilingual project. 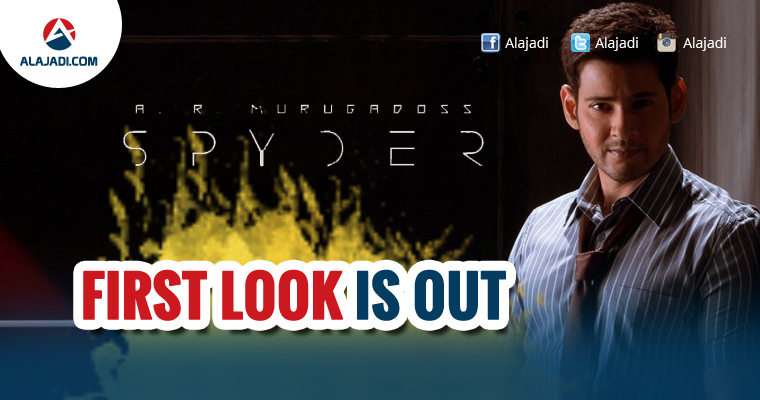 In the first look, we can see Mahesh Babu holding a gun in his hands and he looks extremely powerful and handsome. Looks like this film will break all the records at the box office. It is heard that the film’s teaser work is currently underway in the United Kingdom. The teaser is going to be of 30 seconds duration and it will feature high standard VFX. The producers are leaving no stone un turned in giving us all, the next level teaser. Mahesh will be seen as an Intelligence Officer in this film and buzz is that it is the most expensive film of Mahesh’s career till date. The film is being producer by N.V.Prasad and will be presented by Tagore Madhu. The film’s music is composed by Harris Jayaraj, Cinematography Santosh Sivan and Edited by A. Sreekar Prasad. The film will hit the screens worldwide on June 23. It features Mahesh Babu and Rakul Preet Singh in the lead roles, while S. J. Surya, Bharath and Nadhiya in important roles. This film marks Superstar’s debut in Tamil cinema. It will be released in two languages Tamil and Telugu. Production began in 2015, and the film’s Principal photography commenced on July 2016.